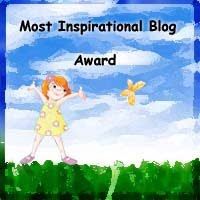 It’s my pleasure to receive this Most Inspirational Blog Award from Kat of Mom’s Place and ITravel. Now, I’m passing on this award to my friends whose blogs inspired me as well. hello Te Tetcha, congrats of your blog award – you deserve it! Mine hasn't yet posted. But anyway, thanks for the comment and congrats again. muahhh! Kudos Mommy Tetch!You deserved this! Thanks for including me here,gonna post it for sure.Really thanks a lot.